The people at Siemens have developed a very powerful but lightweight electric motor. With 4 of these you could make a big quadcopter that could carry some number of humans. We will see humans on quadcopters in the next few years. The prop below is sized for a fast moving airplane. For a slower quadcopter the blade would be another foot or two across and a little flatter angle. For short times you could use batteries or long times a turbine/generator. 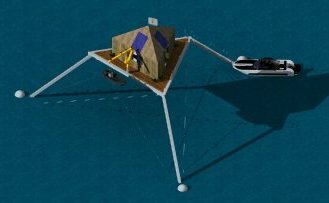 If all you want to do is go from a floating home 12 miles out to land and back, batteries would probably work fine. If you want to go far, then turbine/generator will be needed but cost more.